Bone Marrow is the soft spongy tissue that lies within the hollow interior of long bones. 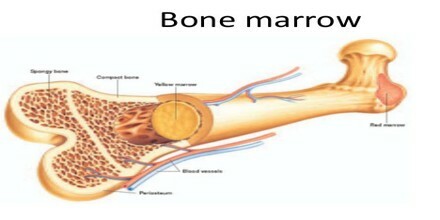 In adults, marrow in large bones produces new blood cells. Bone marrow forms around 4% of total body weight (around 2.6 kg in a healthy adult). The bone is made up of compact bone, spongy bone, and bone marrow. Compact bone makes up the outer layer of the bone. Spongy bone is found mostly at the ends of bones and contains red marrow. Bone Marrow is found in the center of most bones and has many blood vessels. There are two types of bone marrow: red and yellow. Red marrow contains blood stem cells that can become red blood cells, white blood cells, or platelets. Yellow marrow is made mostly of fat. The hematopoietic component of bone marrow produces approximately 500 billion blood cells per day, which use the bone marrow vasculature as a conduit to the body’s systemic circulation. Bone marrow is also a key component of the lymphatic system, producing the lymphocytes that support the body’s immune system. 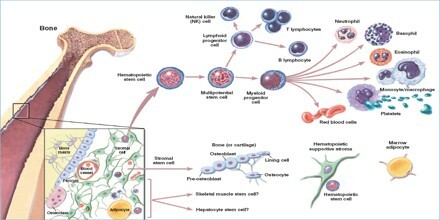 A bone marrow procedure, commonly referred to as a bone marrow or bone marrow aspiration with or without biopsy or trephination is a technique used to obtain a sample of the blood-forming portion (marrow) of the inner core of bone for examination in the laboratory or for transplantation. A bone marrow aspiration consists of inserting a special needle into a bone and withdrawing the marrow by suction. A bone marrow biopsy takes out a larger piece of the bone marrow by coring out a sample of the marrow. 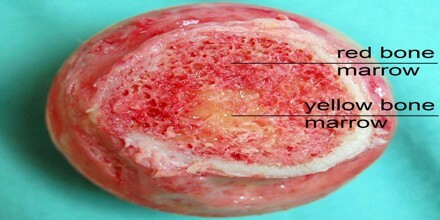 Bone marrow can be 1 of 2 types, red or yellow, depending on whether it consists of mainly hematopoietic (and therefore, red-colored) tissue or fatty (and therefore a yellow-colored) tissue. Both types of bone marrow are highly vascular, being enriched with numerous blood vessels and capillaries. Red marrow is found mainly in the flat bones, such as the hip bone, sternum (breast) bone, skull, ribs, vertebrae, and shoulder blades, as well as in the metaphyseal and epiphyseal ends of the long bones, such as the femur, tibia, and humerus, where the bone is cancellous or spongy. Yellow marrow is found in the hollow interior of the diaphyseal portion or the shaft of long bones. By the time a person reaches old age, nearly all of the red marrow is replaced by yellow marrow. However, the yellow marrow can revert to red if there is increased demand for red blood cells, such as in instances of blood loss. The bone marrow is found within the central cavities of axial and long bones. It consists of hematopoietic tissue islands and adipose cells surrounded by vascular sinuses interspersed within a meshwork of trabecular bone. It accounts for approximately 3% of the body weight in adult rats, ~2% in dogs and ~5% in humans. 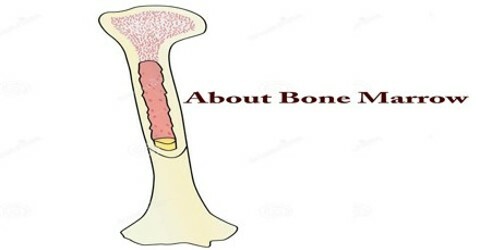 The bone marrow is the major hematopoietic organ, and a primary lymphoid tissue, responsible for the production of erythrocytes, granulocytes, monocytes, lymphocytes and platelets. The inner surface of the bone cavities and the outer surface of the cancellous bone spicules within the cavities are covered by an endosteal lining consisting of a single layer of flat “bone-lining cells” supported by a thin layer of reticular connective tissue; osteoblasts and osteoclasts are also found within the endosteal lining. The nature of bone marrow in different parts of the body changes with age. During childhood, bone marrow in all bones is red. In adulthood, the bone marrow cells in long bones of hand and leg become non-functional and are replaced by fat cells to form yellow bone marrow. The only bones to carry red bone marrow throughout life are the vertebrae (back bones), sternum (breast bone), hip bone, and skull bones. Bone marrow innervation occurs with myelinated and non-myelinated nerves that enter through the nutrient canals. Some innervation also occurs through epiphyseal and metaphyseal foramina. Nerve bundles follow the arterioles with branches serving the smooth muscle of the vessles or, occasionally, terminating in the hematopoietic tissue amongst hematopoietic cells. Red Blood Cells (RBC)- transfer of oxygen from lungs to body tissues. White Blood Cells (WBC) – fighting infections by production of various types of cells (T Lymphocytes), chemicals, and antibodies (specific proteins against micro-organisms). 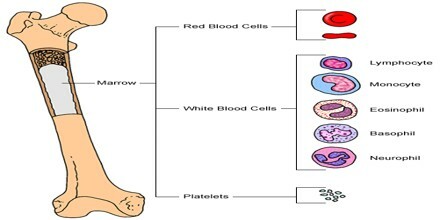 Platelets – clotting of blood after any injury to prevent blood loss. The bone marrow receives feedback from the flowing blood and controls the number of cells produced for a particular cell type. Overproduction of a particular cell type, especially that forced by disease, like leukemia, suppresses production of other cell types leading to corresponding symptoms.Bone marrow cells are highly sensitive to radiation due to their constantly dividing nature. Radiation therapy for any cancer or disease causes a substantial loss of bone marrow cells. This condition is called aplastic anemia, in which there is a generalized decrease in the number of cells present in blood (cytopenia). In the absence of adequate quantities of bone marrow or during increased requirement of blood cells, the body can stimulate conversion of yellow bone marrow to red bone marrow in an adult. This leads to presence of red bone marrow at unusual sites in an adult.